OFFICIAL BOOK BLURB: Daniel Faust, Las Vegas sorcerer and career criminal, has never pulled the trigger on an innocent man. When the infernal Prince Sitri challenges him to do just that, though, he can't walk away. His lover, Caitlin, is Sitri's right hand...and if Daniel refuses the job, he'll never see her again. While Daniel works to unravel Sitri's twisted game, putting his principles and his life on the line, Caitlin has problems of her own. A pack of renegade halfbloods are in town, armed to the teeth and aiming to go to war with hell itself. Their leader is a bad memory from Caitlin's past, one she thought dead and buried centuries ago, and he's got revenge on his mind. As if that isn't bad enough, the fallout from Daniel's last job descends in the form of an FBI task force, aimed at putting him and everyone he cares about behind bars. The feds have a magician of their own, one who knows all of Daniel's dirty little secrets. Throw in a mythical road map to hell and the ghost of a 15th-century serial killer, and the stage is set for a deadly collision. Sitri's games are never what they seem. Everything is connected. If Daniel and Caitlin can't solve the puzzle in time, the consequences will tear them apart forever. FORMAT/INFO: Redemption Song is 380 pages long divided over forty-four chapters and a prologue and an epilogue. Narration is in the first-person, via Daniel Faust solely and third-person narratives for the prologue and epilogue. This is the second book in The Daniel Faust series. 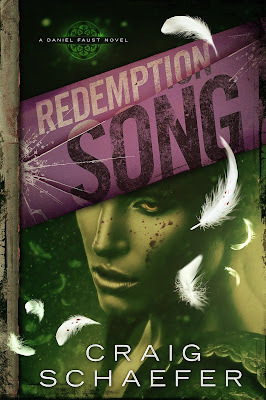 June 13, 2014 marked the North American paperback and e-book publication of Redemption Song and it was self-published by the author. Cover art and design is by James T. Egan of Bookfly Design. ANALYSIS: Redemption Song is the sequel to The Long Way Down and the second volume in the Daniel Faust series. It's set close to a month after the events of the first book and about a week or so after the events of The White Gold Score. The book can be read by as a standalone but keep in mind, it references quite a few events from its predecessor and builds up on a couple of plot threads so it won't be ideal to read it before The Long Way Down. In this review, there will be mild spoilers for some minor aspects of the characters cast so fair warning for those who want an absolutely unspoiled read. The plot of this book builds up from the events of the last book, as Daniel Faust and Jennifer are suckered into a trap. The retribution comes in form of the FBI namely Harmony Black, an FBI agent who also is on the same paranormal threshold as Faust. Forced to defend his ways and his tracks, Faust gets further waylaid when Prince Sitri, Caitlin's boss and lord of the Court of Jade Tears mandates Faust to finish a task or never be able to meet Caitlin EVER again. Trapped between the FBI and Hell (literately), he also has to contend with a cambion (half-human, half-demon hybrids) crisis as a renegade group has come to town to do the impossible. These are the troika of plot points that power the story, sure there's a lot more going on and much that I'm being vague about as it's essential to prevent spoilers. This book is a solid improvement on The Long Way Down as not only does the reader know a bit more than the first time around, but the author really gets to develop the world, gives the backstory about many of the characters, their history, & much more without it becoming like an infodump. I loved how the author keeps the tension high-strung throughout and every time Faust feels that he's one-upped his circumstances, there's one more wrinkle to keep him on the back foot. There's a lot more backstabbing and double betrayals in this one and all of it seem very organic. This is what I loved about this story, it's a thriller while being an urban fantasy and the author does his best to introduce some humour from time to time. He also introduces some minor characters who are very intriguing and one such person is Baron Naavarasi who is delightful (to read about) with her intrigue and deadliness. I look to learn more about her and her machinations. There's also a nice plot twist with regards to French history and even though it focusses on a genuinely detestable individual, I liked how the author picked up an obscure character who added so much to the story. The book's pace is such that the reader will be constantly on tenterhooks to see what happens with Sitri, Harmony Black and the main cambion plot. The character cast is very wonderfully expanded and all of this is done without losing any sheen on Faust. In this aspect, Craig Schaefer manages to comfortably rub shoulders with Jim Butcher. However the one crucial difference between them is that Craig's world is resplendently mired in grey & shades of black with some splashes of white. This is very much shown vividly towards the end of the book (when our main protagonist does something incredibly stupid or smart, I'll let you decide). I loved this aspect of the storyline as it very much mirrors the real world and the author also gives us (the readers) some background about the nature of magic, the world, Hell and its courts, Cambions (what are they, why are they the way they are, etc). There's a lot of worldbuilding very wonderfully encapsulated between dialogue snippets and plot revelations. The author also shows the growing relationship between Caitlin & Daniel and it seems to glide smoothly from The White Gold Score. I liked how the author switches gender tropes and makes Caitlin the one with all the power cards. Daniel though is not without powers of his own and it's his mental fortitude that makes stand out as a character and a player to be reckoned with. CONCLUSION: All of the above factors made this book a solid read for me and also cemented this series in my mind. I have to say this book just stops short of being a 5-star book because of some plot threads being left open to be finished in the next book. I don't think this will be a major disappointment for most folks but it might rankle some. Overall I thoroughly enjoyed this book and after finishing immediately jumped onto the next as was the author's plan all along. I've got a few books before this one on the audio, then I'm returning to this series as I really love what he's created here.